If you haven’t already, please read the ‘disclaimer’ at the top of the parent page here. 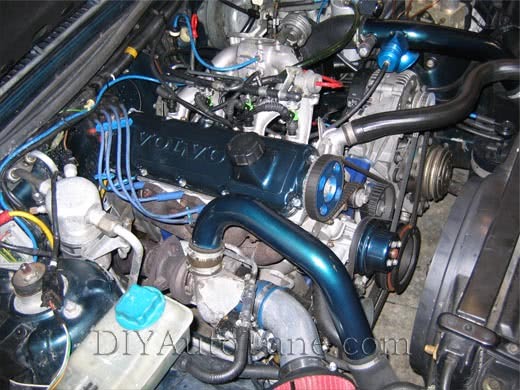 The Volvo 240 and its relatives have a well balanced rear wheel drive chassis and a solidly built engine, but when you start adding boost the stock engine management system can have problems accounting for the extra air flow. Fitting a MegaSquirt to these cars allows you to properly tune the engine for anything from a mildy modified car to an all out turbo drag buildup or IT racer. While there’s a lot of similarities between the 240, 740, and 940 chassis, Volvo used several different fuel and ignition control systems over the years. They did not always keep the electronics the same across all three models, or from naturally aspirated to turbo motors. Note that our tech ‘Install Articles’ typically focus on the most confusing part of the install process for the end user, and that’s taking control of the ignition system. This is the part of the process that’s different from car to car and hence we chime in with specifics to help where we can. For the rest of the details, the parts that are the same on every car like the coolant, intake, TPS, and o2 sensors, see the wiring section at MSEXtra.com. This article covers 1985-1989 Volvo 240’s, 740’s, and 940’s with the Bosch LH2.2 Ignition/Fuel control system, as well as other years which have been fitted with the distributor and ignition module this car used. The Bosch Hall effect distributors let you use almost any MegaSquirt variant out there. The Bosch LH2.2 system kept the ignition control separate from the fuel control (two separate computers), and these used a Hall effect sensor in the distributor that reads a rotor with four vanes on it. This ignition system is pretty easy to take control of. One way to spot the Bosch LH2.2 system in your Volvo is it used an external ignition module (ignitor box). These engines did not have a crank trigger. Bosch built several different ignitor boxes during this time period. Most of the ignitors installed in Volvos appear to have left dwell control up to the ECU. If you have an L-Jetronic or LH-Jetronic EFI system, you can simply wire the injector wires that led to the ECU to the MegaSquirt instead. With a K-Jetronic mechanical fuel injection system, you will also need to swap your fuel system over to EFI. Many non-turbo 240s used a Chrysler ignition through 1988, with a Bosch fuel injection system. That means a Chrysler Ignition Computer, and a Bosch Fuel Computer, working mostly independently of one another to meet the engine’s needs. We have confirmed that this system was used as far back as 1982. You can spot a Chrysler Ignition system by its lack of an external power stage module (aka ignitor) – with the Chrysler ignition system the coil is wired straight to the Ignition ECU (remember these cars will have a separate computer for ignition and for fuel). It is not clear if the Chrysler distributor works in the same way as the Bosch distributor or not. Later engines, starting around 1989, used a 60-2 crank trigger. As with the Chrysler distributor, the settings for this one are not as well documented, although MegaSquirt can control this too, the details just aren’t in this article. Ask us if you’d like help. At the moment, this article covers the Bosch LH2.2 distributor. Information on the Chrysler and crank triggered setups will be added as it becomes available. Since there is no need for a VR conditioner or onboard coil driver, you can use the V2.2, V3.0, or V3.57 board. Remove D5, D8, and R10. Also remove the jumper between XG1 and XG2. Replace D8 with a 1K resistor. Run a length of wire from XG1 to the right hole of D5. Run a wire from the bottom hole of R10 to the top of R11. Run a 750 ohm to 1K, 1/4 watt resistor from the right (5v) side of R23 to the negative (top) leg of D17. Run a wire from the negative leg of D17 to X11. Get a 1K 1/4w resistor and cut the leads down to about 1/2″ at each end. Maybe a bit less. Tin each end of the resistor with a bit of solder. Cut a 5″ piece of hookup wire (22ga is fine) and strip just a 1/8″ or so. Tin the stripped wire with solder. Melt the tinned wire tip to one end of the tinned 1K resistor tip and let it cool. Heatshrink wrap this wire/resistor assembly. Use this wire/resistor combo to connect OptoIn to one of the 5 volt holes in the proto area. Solder a 750 ohm to 1K, 1/4 watt resistor from the right (5 volt) leg of R24 to the top (negative) leg of D14. Run a wire from the top leg of D14 to IGN. For this one, you’ll remove the jumpers on XG1 and JP1. Put the jumper on J1 in the 1-2 position for optical output. Use this wire/resistor combo to connect pin 3 of the JP1 jumper to one of the 5 volt holes in the proto area. Solder a wire from XG1 to pin 2 of the JP1 jumper. Run a wire from PAD1 to the center hole of Q16. Connect the signal wire from the Hall effect sensor on the distributor to pin 24 (Tach on the relay board, if used). See notes at the bottom of this article for the wiring colors on various distributors. Connect the #5 pin of the Bosch ignition module (for a 124 type module) or #6 pin (for a 139 type module) to the MegaSquirt’s spark output pin. On a V3.0 or V3.57, this is pin 36. On a V2.2, this is pin 25. Configured for MSnS Spark Output using LED 17 (D14). In MegaTune, you must set Spark Output Inverted to No. Set the Dwell Control mode to Fixed Duty with a 50% duty cycle if you have a 139 type module. If you have the 124 type module (Volvo P/N 1 332 584), you will need to use dwell control instead. The Trigger Angle setting will depend on the physical location of the trigger pickup. Often, an angle of 60 degrees will get you in the ballpark. To set the timing with MSnS-E, go to the Spark Settings menu and set Fixed Angle to 10 degrees. You can then set the ignition timing to 10 degrees with the engine running, using a timing light. Once you have set the base timing, set Fixed Angle to -10. This will tell MSnS-E to use the timing map. See the MS1/Extra manual on Bosch 139 modules for more information. Note: This version does not work with the Bosch 139 module. Build the Hall effect input conditioner circuit, as described in the MSExtra’s MS2 Manual. All our preassembled MegaSquirts with the V3.0 board come with this circuit installed. You’ll need a 1K pull-up resistor from the 5 volts in the proto area to TachSelect. Put the XG1 to XG2 jumper in place across both pins. Put JP1 in the 2-3 position and J1 in the 1-2 position. Solder a 1K resisor across the R57 pads. Connect the #5 pin of the Bosch ignition module to the MegaSquirt’s pin 36. You must also set the initial position of the trigger (called the ‘trigger offset’), then check it using the Trigger Wizard in MegaTune (Tools Menu). The trigger offset setting will vary according to your distributor position (where it is in rotation) but you’ll need to set it properly… Basically you use the Trigger Wizard and adjust the ‘trigger offset’ and/or twist your distributor until the advance number in the Trigger Wizard matches what you’re reading with your timing light. The +/- buttons on the trigger wizard will adjust your trigger offset. You’ll need to use these buttons and a timing light to make the number on your light, and the big number on the left in the Trigger Wizard, match up. Before tuning your advance table, be sure to use a timing light to verify that your ‘trigger offset‘ is calibrated. Changing the Trigger Offset in MegaTune will not change the displayed advance, instead, it changes the actual advance as seen with a timing light. Your goal is to make these two match. It appears that earlier models may have used a thermal auxiliary air valve for idle control. Later ones used a pulse width modulated idle air control valve. V3.57 boards need no modifications to control the PWM valve, while V2.2 and V3.0 boards will need a TIP120 transistor, like the one included in our MK-PWMIAC mod kit. These car can use just about anything in the Megasquirt family, although the V2.2 can limit your injector options unless you use the flyback board. The Megasquirt-I V3.0 (or V3.57) will work well for a good basic system. The Megasquirt-II can provide a better idle if you are running very large injectors, so it can be useful on high boost buildups but not required. You will be able to use your existing sensors except for the MAP sensor which is built into the Megasquirt. If you are looking for an assembled unit with the mods in this article already installed, please contact us directly.